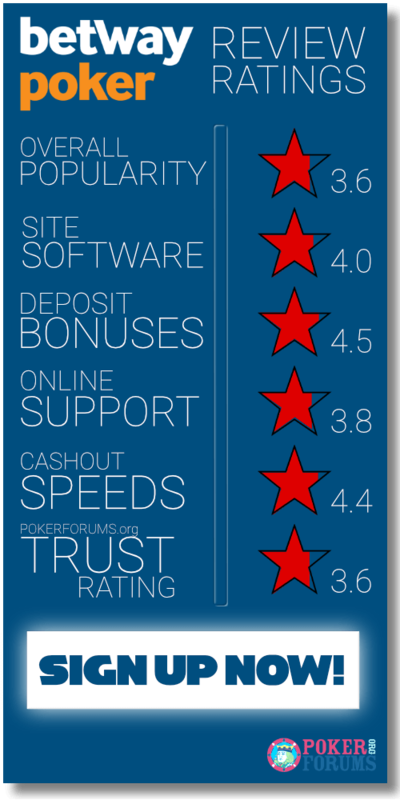 We are currently recommending BetSafe Poker as the best option on the MPN Network. Make sure to check it out, so you have the best information when choosing an online poker site. Established in 2006, the Betway Group is a world-class online gambling company offering entertainment across several products including Betway Bingo, Betway Vegas, Betway Casino, Betway Poker, and Betway Sportsbook. The Betway Group also runs several other brands such as Spin Casino, Bingo on the Box, and Dream Bingo. The flagship brand of the Betway Group is of course Betway, an international gaming company operating across regulated marketplaces with licenses in Ireland, Germany, Belgium, Spain, Denmark, Italy, Malta, and the United Kingdom. The Betway Group is situated in Guernsey and Malta, with support from Isle of Man, Cape Town, and London. The Group is also a member of the Remote Gambling Association, the Independent Betting Adjudication Service, and the European Sports Security Association, and is accredited by eCOGRA, an international testing agency. In addition, the Betway Group also has boasts with a partnership with the Professional Players Federation, promoting, protecting, and developing the collective interests of professional athletes in the United Kingdom. The company is also a supporter of the Responsible Gambling Trust. Betway utilises the very popular and world-renowned Microgaming Poker Network (MPN) to offer their poker product to players across the globe. The Microgaming Poker Network has been in existence for more than a decade, and was ranked as one of the top poker networks in Europe in 2005. Back then, the Microgaming Poker Network was known as the Prima network and was the very first place where high stakes were introduced, featuring the likes of Patrik Antonius and Johnny ‘bad_ip’ Lodden among others. A large part of the networks early success was because Expekt.com was a famous skin of the Prima network. Reports stated that more than 40% of the network’s traffic was brought in from them alone. When Experkt decided to pack their bags, and move to the Tian Poker Network, they also took a massive number of poker players along with them. The addition of Unibet that was introduced shortly after they left did help to soften the blow, but it was still a significant setback for Microgaming and their dreams of becoming a tier 1 poker network. Furthermore, the network has been hit by many controversial incidents since and this also weakened their overall ambitions. Initially, almost 30 skins of the Microgaming network went bankrupt during 2008, taking their player funds with them. In 2009, one of their flagship sites, known as Eurolinx, managed to shock the poker industry by announcing bankruptcy. These scandals have truly crushed the Microgaming network and, in all honesty, they haven’t been able to bounce back and make a full recovery. From a premium poker network that was once ranked in the top 5 in the world when it comes to player traffic, they have plummeted down to 11th place in the world. We are highly doubtful that the Microgaming Poker Network will ever regain their place among the leading poker networks of the world. However, this doesn’t mean that playing at Betway is necessarily a bad thing if you want to play poker against other players. We believe its actually a very positive thing. Overall, Betway Poker provides one of the best player rewards program in the poker industry when compared to other leading poker sites. The gameplay is smooth, the graphics are sharp, and the customer support service is widely recognized as one of the absolute best in the online gaming industry. You can easily speak to a poker representative at any time of the day or night. Furthermore, the poker room offers a great selection of bonuses and promotions to keep players interested, and with some ridiculously low competition on the lower stake tables, Betway Poker makes for an excellent choice for a novice to intermediate poker player. If you are new to online poker, you certainly won’t fare badly if you stick to the lower stake tables while coming to grips with how things work. Lastly, there’s also a great variety of deposit and withdraw options available to players across the globe and their processing times are more than reasonable, regardless if you decide to use your credit card or e-wallet to deposit funds or take out your winnings. Betway offers a simplistic and modern user interface with orange and black being the site’s primary colours. Betway offers a great collection of products including eSports, Vegas, sportsbook, poker, bingo, in-play, and an online casino. All products can be downloaded onto your desktop computer, and support those who prefer Mac. However, when downloading the Betway App onto your mobile device or tablet you will gain access to each of their products except for their poker product. They have not yet optimized their poker room to feature on the mobile platform which in all honestly is rather disappointing to say the least as everyone is playing from their mobile devices in today’s day and age. Betway offers several ways to gain access to their software. You can either download the software directly onto your computer from their site, giving you access to all their products through an innovative and good-looking software product, or you can utilise their instant-play platform where no download is required. You simply need to visit their website and click on instant-play when playing on a desktop computer. They also offer players the opportunity to download their state-of-the-art mobile app where you can take advantage of most of their gambling products. The mobile app can either be downloaded from the Google Play Store when using an Android device or from iTunes when using an iPhone or iPad. Both the desktop version and mobile app will give you access to the latest promotions, a wide range of payment methods, and loads of different casino games and sportsbook markets. Downloading the poker client to your desktop is extremely easy, and you can follow these steps, indicating where to download the poker software and what to expect once the software is downloaded onto your computer. The same steps will apply to Mac users. Open a browser on your computer and search for www.betway.co.uk. The homepage of Betway will open, displaying all of their products listed at the top of the page, including Sports, In-play, Casino, Live Casino, eSports, Vegas, Poker, and Bingo. Select the poker section of the website. A new page will load displaying all poker related promotions along with a ‘Download’ button and an ‘Instant Play’ button located at the top of the poker page in bright orange colours. Click on ‘Download’ and wait for a pop-up to appear that you will need to accept to start the installation process. Depending on your computer settings, the file will download automatically and is usually 1mb in size. Once the file is downloaded, you can locate the installation file in your downloads folder or at the bottom download bar within your browser. Wait for the installation file to download completely and then click on the installation file. Your computer will then ask you if you accept Betway to be installed onto your computer. Click ‘Yes’. A big grey pop-up will appear with a massive orange ‘Install’ button. In the top right-hand corner, you can select between 13 different languages before clicking on the ‘Install’ button. Click on ‘Install’ and wait for the software to download directly onto your computer. Once the poker software has completely downloaded, the Betway Poker client will open automatically. This may take a few moments and will greatly depend on your internet speed. If you already have an account with Betway, you can simply log in through the Betway poker software. If not, register a new poker account by clicking on ‘Register’ and completing a selection of personal questions, including first name, last name, DOB, home address, email address, etc. Once your account has been successfully registered, you can head over to the cashier to make your initial deposit and claim the welcome bonus. Downloading the poker software on your mobile device or tablet is basically the same as downloading it onto your desktop computer. The difference comes in when you use an Android device or an iOS device. Open a web browser on your mobile device or tablet and search for www.betway.co.uk. If you are using an Android, you will find a ‘Download’ link available directly on their website. Click on the download link and wait for the installation process to complete. Open the Betway software and register a new account. If you already have an account, you can simply log in. The downloading process for iOS users is a bit different as you’ll need to visit the iTunes Store instead of a website. Visit the iTunes Store and search for Betway. Tap on the ‘Free’ button located on the right-hand side to download the Betway app. Once the download process is completed, you will find the Betway app displayed on your screen. You can now launch the Betway app and register a new account if you haven’t done so already. Betway is considered the flagship brand of the Betway Group, one of Europe’s largest online gambling companies with more than 1,5 million customers. The site carries a reputation for high-quality games and a variety of jaw-dropping promotions and bonuses, and it recently also capitalised on a fantastic mobile version of the site. Please take note however, that the mobile site and app does not support poker. Betway has yet to develop a poker app, and therefore players will only be able to access the sportsbook, In-play, online casino, and Vegas sections of the site on their mobile device or through the Betway mobile app. This is certainly one of the biggest flaws to the Betway site, probably losing out on millions due to not offering a mobile app specifically aimed towards their poker client. Nonetheless, we reviewed their mobile app for their sportsbook and online casino sections to see how well the Betway mobile app handled under our rigorous testing. We decided to first test their sports betting section through the mobile app, as it requires far more reliability and phone processing to handle the various bets you can place on the different markets. Whether you’re a fan of basketball, cricket, rugby union, rugby league, tennis, or football, Betway has everything you need through their innovative mobile app. Although the company doesn’t share the same pedigree as other bookmakers with a much longer tradition when it comes to sports betting, Betway has rapidly grown to become one of the best sports betting destinations in the business. Betway allows you to download the mobile app on via Android, iPhone, Windows, and Blackberry. This makes the sports betting mobile app from Betway one of the most flexible apps in the industry. The initial attempt at a mobile sport betting app was horrible to say the least, and it couldn’t even be considered as a good overall mobile experience on any level. Fortunately, Betway went back to the drawing boards and created one of the best looking mobile apps in the world. The sports betting app will allow you to jump between markets in no time, and will allow you to place bets on pre-matches as well as in-play events. Not only is the app incredibly stable, but its also easy to navigate, making it very convenient to place a wager with your hard-earned money. One of the best features in the Betway Sports betting app is the ability to watch live streaming of all major sporting events directly on your mobile or tablet device. Regardless of where you are in the world, you can now watch ice hockey, football, tennis, and many other sports directly from the palm of your hands. Like the desktop version of the casino, Betway Mobile provides a great range of casino games from Microgaming, an award-winning software provider with well over 600 different casino games. Betway utilised its mobile Microgaming Go system to successfully optimize the casino games to fit on a mobile screen and tablet without sacrificing the tempo-thumping sounds o high-quality graphics. Each casino game has been specifically designed and revamped for mobile users, with 90% of the games being played in landscape mode to take advantage of the high definition, large smartphone screens. The mobile app can either be downloaded through the Google Play Store for Android users or through the iTunes store for iOS users. Moving around the Betway Mobile app within the various sections on offer is quite easy and quick and can be achieved by a simple swipe or tap of the screen. The main categories are displayed above the screen while additional features and settings are included on the top left-hand side, or by selecting your player name at the top right-hand side. Located at the bottom of the page are links that will take you to the banking section or promotions page. Although it’s a mobile app, you’ll still be treated to over 50 casino games that have been carefully selected from the top 600 casino games that are available on the desktop version. The majority of the games are slot titles as well as progressive slot games to give players a thrilling spinning experience while on the move. When it comes to promotions, players can claim the same range of bonuses offered on the desktop version of the casino. We were quite disappointed to find out that Betway somehow neglected to offer specialised promotions and bonuses to mobile-specific players. Overall, the mobile app is a great addition to the Betway platform, offering reliability and stability without any lag or disconnections whatsoever. The biggest downside to the app is that it doesn’t offer a poker app. Betway is missing out big time without it and we sincerely hope that they look into this very soon. Betway offers a fantastic start for newly registered players with a marvellous welcome package aimed towards poker enthusiasts from across the globe. Once the Betway Poker software is successfully downloaded and installed, register a brand-new account and head over the to the cashier to make your initial deposit. Newly registered customers can look forward to a 200% match bonus up to a maximum of £750. In addition, newly registered customers will also automatically qualify for entry into six different new player freerolls valued at more than £6,000 that can be played every Wednesday. To claim the full bonus amount of £750, players residing in the UK will need to deposit £375. The £750 welcome bonus will then be credited to your bonus balance and will be considered a pending bonus. To release the welcome bonus, players will need to accumulate Poker Loyalty Points. You can earn Poker Loyalty Points by either playing in cash games or by playing Sit and Go tournaments and multi-table tournaments. For every $1 in cash game fees, you will earn yourself 10 Poker Loyalty Points, and for every $1 in tournament fees, you will also earn yourself 10 Poker Loyalty Points. The welcome bonus is released in 1% increments, and therefore you are required to accumulate 763.05 Loyalty Points to release £7.50. The welcome bonus expires in 60 days, giving you ample time to accumulate the required Loyalty Points to successfully convert the pending bonus. Betway also included a section where you can monitor your progress within their poker software. Simply click on ‘My Account’ and then ‘My Bonus’. This will give you updated information on your accumulated points and how much you still need to earn before the next increment is released. Betway features a unique Anonymous tables promotion and will re-write the rule book for online poker players and how to the game should be played using an old western theme. Picture yourself rolling into a saloon in a small western town and taking a seat at a poker table with cheap whiskey flowing and your trigger finger itching. You will have no idea who your opponents are and neither will one of them. During the old west, poker was unforgiving, rough, and raw and you basically had to earn your edge. That is exactly what Betway is illustrating with this promotion, removing the comforts by taking away statistics and notes from the game, only leaving you and your opponent. To find Anonymous tables, you simply need to search for the A icon located next to tables. Once you enter a table, you will only be able to see the alias and avatars of other players. WE think this is a great way to test your skills against other players without any additional information to help you along. The remaining 20% will seed the next Jackpot. Betway also offers fast-paced poker tables where you can win up to 4 times as many poker hands as opposed to a normal poker table. You can easily find the Blaze Poker tables within the poker lobby by simply Choosing the game under the navigation bar. So, if you want more exhilaration and speed while playing poker, this is certainly something to consider. The Betway poker site is not only safe and secure, but also has an added benefit of being home to a large portion of fish in the European market. While the Microgaming network still has grinders and professionals, there are far fewer when compared to other poker rooms, and another benefit is that the games are much softer. 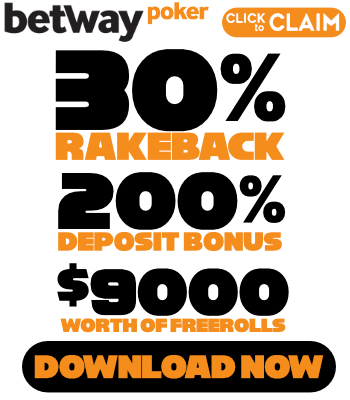 This is purely because Betway is not widely known for their poker offering, but more for their outstanding sportsbook and superb online casino. These two products bring in a significant number of recreational players that eventually want to test their luck at online poker. Thus, ensuring there’s always a constant flow of weaker poker players available on the Microgaming Poker Network. Players are able to choose between 20 different languages on the Betway poker software and once they are logged in, they will have a wide range of poker games at their disposal, including Hold’em, Omaha, Seven Card Stud, Five Card Draw, and more. The Betway Poker software provides some of the best high-quality graphics along with smooth and lightning fast gameplay functionality. Unlike other leading poker rooms, Betway will either choose a random avatar for you, so that you can place more focus on the game itself, or you have the option to choose your own avatar from a personal gallery on your computer. The software provides a simple look and feel with more detail on the table and game itself as opposed to statistics and additional information which we love. Betway is also home to multi-tabling with a fantastic choice of up to 8 different tables at once. Although this is somewhat lower than the usual 16 tables we have seen at other leading poker rooms that also allow multi-tabling, we think 8 is more than enough to keep you occupied without much breathing space in between hands. We tried 8 tables at once and felt rather lost at times, so we can’t imagine playing on 16 different tables at once. The one slight drawback to the poker software offered by Betway is the fact that the card suits are quite difficult to read when you decide to utilise the multi-table feature. The tables will then obviously be a lot smaller than usual, so it’s not a major surprise. Keep in mind that this happens when you play at more than 4 tables, if it’s just two tables at the same time you won’t experience this problem. The Betway poker layout itself is remarkable to say the least. The animation quality of the table and surrounding graphics to create an awesome theme is well executed. You will also have the option to change most of the layout with a range of different colours and themes to suit your unique playing environment. Situated around the table are plenty of additional settings and statistics. At the bottom left corner, you’ll find a range of different categories that have been neatly presented within a semi-transparent window. These categories include your chat window to talk to other players, your game options, including Sit Out, Wait for Big Blind, Auto Post Blind, and Much Losing Hands, your poker hand statistics ranging from head to head percentages to how often you fold on the flop and many other innovative statistics to keep you up to date on how well you are doing. Located in the top left corner is the hand number of the table, the previous hand played, and your rake amount. In the top right-hand corner, you will find your game menu with a bunch of additional settings that can be altered, including poker table layouts, sounds, and more. You can also buy additional chips without having to leave the poker table by clicking on the ‘Chips’ button, or you can return to the lobby to look for another seat at a different poker game by clicking on the ‘Lobby’ button. You can also switch between the online casino, card games, table games, and the sports book product thanks to a range of symbols in the top right-hand corner. Located at the bottom right-hand corner is your bet information for each hand. All these additional features are neatly presented around the table and away from the poker action on the table to ensure none of them distract you while playing. Betway used a simplistic layout to ensure that even the most inexperienced player can easily find their way around the lobby. The lobby is presented in different shades of grey to portray the various games while the headings are all written in white to make them stand out and easy to read. The lobby is divided into three main categories, including Cash Games, Sit & Go, and Tournaments. In the Cash Games section, you will be presented with 3 main tabs, including Hold’em, Omaha, and Free Play. Each of these tabs will also have sub-headings displayed underneath them to highlight the different poker tables available at Betway. The Texas Hold’em tab offers No limit, Fixed Limit, and Heads Up tables. What we really like about the layout is that you can also arrange the tables according to Anonymous tables and Blaze Poker tables for much faster gameplay functionality. The Anonymous tables ensure you can’t be tracked by sharks, and that your avatar and alias are only visible to you. It also ensures other player details are hidden from you while playing at Anonymous tables. Located below the list of tables are more filters where you can hide full tables or hide empty tables, as well as filter the tables by seats and tables. Listed at the top of the tables are several subheadings, including Table Name, Stakes, Limit, Game, and Seats. You can also arrange the list of poker tables by simply clicking on the subheading. The Omaha tab is arranged in much the same way and includes Pot Limit tables and Heads Up tables when you want to play Omaha instead of Texas Hold’em. The third and final tab is Free Play where you will find a selection of Play Money tables coloured in blue. You can either play Hold’em or Omaha for fun to get into the swing of things before heading into a cash game. This is perfect for those just starting out without having to spend their hard-earned money to learn a lesson. The same set of filters are available in every category, making it very convenient to quickly find what you are looking for. The Sit & Go category offers 4 tabs, including Hold’em, Other, Special, and Free Play. The Hold’em tab consists of Regular, Heads Up, and Double Up Sit & Go tournaments while the Other tab is dedicated to providing Omaha Sit & Go tournaments. Fortunately, Betway also offers a great selection of Free Play Sit & Go tournaments that will allow players to get used to how a tournament operates before testing their luck on a cash game tournament. The Tournament section is all about the poker tournaments currently available at Betway. You can also categorize them according to guaranteed tournaments, Satellites, Freeroll, and Special. We were also surprised to find that the tournament you currently qualify for will be highlighted in green, making it quite easy to find those that you can enter without scrolling through pages to find something that you might be able to enter. Betway Poker, previously known as Gnuf Poker, has formed part of the Microgaming Poker Network since 2009 and has joined more than 30 other skins. The Microgaming Poker Network has managed to maintain a reasonable number of poker players along with ring games filling up rather quickly, as well as tournaments running constantly. Forming part of such a massive network greatly assists in pulling in player traffic from across the globe on a regular basis, especially fishiness. Unfortunately, Betway Poker does not accept any registration from the US market due to the UIGEA regulation that was passed in 2006, and therefore this poker room will only be available to non-US poker players. During peak hours, the site averages around 9,500 online players, offering real-money action at micro, small, and medium stake tables. In addition to their great selection of ring games, the site also provides anonymous tables allowing player names and statistics to be hidden during play. Betway hosts a great selection of guaranteed tournaments and Sit & Go tournaments. The tournaments are available daily, weekly, and monthly with a wide range of different buy-in denominations to suit any kind of poker player. We listed their most popular guaranteed tournaments, as well as the most popular Sit & Go tournaments to give you an idea of what to expect when registering with Betway Poker. Betway offers a marvellous range of daily and weekly guaranteed tournaments with some serious prize money up for grabs. There are multiple tournaments listed in the poker room and therefore we decided to list some of the most popular tournaments that attract the most players to ensure you get in on the action. This is a No limit Hold’em Guaranteed tournament for a maximum of 6 players taking place twice a day. You can either participate at 03:30 BST or at 05:30 BST with a buy-in of £10 + £1. Players start with 3,000 chips and level intervals are 6 minutes apart. This is quite a unique guaranteed tournament where early player registration will give you an additional 1,000 chips. The buy-in to this tournament is only £3 + £0.30 and you will receive 3,000 chips to start with, and level intervals are 10 minutes apart. This makes it an ideal tournament for newly registered players looking to find their feet when it comes to the world of poker tournaments. This No Limit Hold’em tournament is another great tournament to take advantage of daily, starting at 21:50 BST and buy-in is a mere £5 + £0.50. Starting stack is 3,000 chips and level intervals are 6 minutes apart. This tournament takes place daily and starts at 21:00 BST. The Daily Express tournament is a Turbo Freezeout Guaranteed tournament with 5,000 starting chips. Level intervals are 6 minutes apart along with an additional hour of late registration. The buy-in for this tournament is £10 + £1. This is another daily tournament taking place at 18:00 BST, but is aimed towards Omaha players. To gain access to the tournament, players need to buy-in £5 + £0.50 with a starting stack of 5,000 chips. Rebuys for this tournament are unlimited and Add-ons will give you 10,000 chips at a cost of £5 + £0.50. This is a fantastic No Limit Hold’em guaranteed tournament taking place daily with a buy-in of £20 + £2. Players start with a stack of 3,000 chips and rebuys are unlimited during the tournament. You can also add an additional 6,000 chips at a cost of £20 + £2. This highly attractive guaranteed No Limit Hold’em Rebuy tournament takes place every Sunday at 19:00 BST and attracts quite a few players. Rebuys are unlimited during the tournament at a cost of £20 + £2. Players start with a stack of 3,000 chips and level intervals are 10 minutes apart. Players can also add-on an additional 6,000 chips at a cost of £20 + £2. This No Limit Hold’em tournament takes place at 19:30 BST every Sunday and buy-in is £200 + £15 with a starting stack of 5,000 chips. For those looking for more serious players at the table as opposed to the Sunday Mosh Pit with a low buy-in amount, this is the one to consider. Level intervals are 15 minutes apart with late registration lasting for 2 hours. There are more than 20 different Satellite tournaments every day, and most of them will offer access to guaranteed tournaments or a ticket that you can use within a year. We included some of the most popular Satellite tournament just to give you an idea of what’s in store when registering at Betway Poker. This is a No Limit Hold’em Satellite and will cost you a mere £3.12 + £0.18. Players start with a stack of 750 chips with level intervals every 3 minutes. Players will receive 1 ticket for every £22 in the prize pool. Players can then use the ticket to register for the guaranteed Mosh Pit. This satellite allows up to 10 players to participate with a small buy-in of £2.20. What makes this satellite so unique, and at the same time quite nail-biting, is the fact that you go all-in on every hand until you are eliminated, or if you lucky, win the prize. The prize is a £22 ticket that can be used to enter guaranteed tournaments such as Luckbox Express or The Mosh Pit. The ticket is valid for up to a year. There are also smaller versions of this satellite including £11, £2.20, and £5.50. This satellite will award 5 tickets that can be used to enter the Gigabyte guaranteed tournament. One ticket for every £110 in the prize pool. Players start with a stack of 2,000 chips and buy-in is £10 + £1. Apart from offering plenty of MTT and Sit & Go tournaments, Betway also provides a wonderful £100,000 guaranteed tournament available every Sunday. There are also loads of Satellite tournament that can assist you with entry into the Sunday event. Players will also be excited to learn that Betway offers the Universal Championship of Poker tournament at their poker room. This is a £750,000 guaranteed tournament with £5,000 waiting for the winner along with a trophy as the Greatest Poker Player in the Universe. A £10,000 will keep track of your progress throughout the tournament where you can earn a maximum of 10,000 points. These two flagship tournaments are bound to receive quite a bit of traffic from around the world, especially when you consider the MPN has been awarded the best poker software for 4 years running. Betway not only offers a fantastic welcome offer consisting of a 200% up to £750 to newly registered players, but also introduces them to six different freeroll tournaments that are specifically designed to get them into the swing of things at Betway Poker. Newly register players can face other newbies once a week to see if they have what it takes to survive at Betway. Within the first 6 weeks, all new players are invited to join the weekly £1,000 New Player Freerolls along with weekly £500 Added New Player Turbo Tournaments. The £1,000 New Player Freerolls occur every Wednesday at 19:00pm UK time, and the £500 New Player Turbo Tournaments take place every Wednesday at 21:00pm UK time with a buy-in of £1 + 0.10. Betway recently added an exciting Saturday Freeroll with a £1,000 up for the taking. To qualify for the Saturday freeroll, you simply need to accumulate 25 raked hands within 24 hours prior to the freeroll. The freeroll takes place every Saturday at 19:00 CET / 18:00 GMT and is structured with 8 minutes blinds along with a starting stack of 1,000 chips. We were under the impression that Saturday was an exciting day at Betway, but we were pleasantly surprised to see that Sunday was actually the day to be playing at Betway, especially if you interested in freerolls. Sunday allows you to win a share of up to £3,000 and all you need is 100 raked hands to qualify for entry into the freeroll. The tournament takes place every single Sunday at 19:00 CET/18:00 GMT and is structured with 8 minutes blinds and a starting stack of 1,000 chips. One of the best freerolls available on Saturday, other than the £1,000 Saturday Freeroll where you require 25 raked hands within the last 24 hours, is the £300 Happy Saturday Freeroll. This is one of the most popular freeroll tournaments at Betway and promises to be loads of fun. The buy-in is free of charge and you can win your share of £300. The freeroll tournament starts at 19:00 CET and you only need 1 raked hand within the last 7 days to qualify for the freeroll. You start with 1,500 chip stack and you can rebuy/add-on 3,000 chips for every £0.25 within the first hour of the freeroll tournament. Apart from some truly awesome freeroll action over weekends, players are also treated to a variety of freerolls during the week to keep them captivated. Every Thursday, you can battle it out to become a poker champion in Betway’s Survivor Freeroll Tournament. During the tournament, the bottom 20% of the playing field will be eliminated after every round, and therefore only the best players will progress to the next round. All remaining survivors at the end of the tournament will win their share of the £150 prize pool, making it quite an exciting and entertaining way to spend your Thursday evening. The tournament takes place at 19:00 CET every Thursday. Another freeroll not to be missed is the £500 guaranteed freeroll every Tuesday where you can win a decent sum of money for nothing. The only requirement to enter the tournament is to accumulate 1 raked hand within the last 2 weeks (14 days). You will also have the option to rebuy within the first hour of the tournament for a mere £0.50 and have one additional add-on. The tournament takes place every Tuesdays at 19:30 CET / 18:30 GMT. Betway provides a wide range of different cash games and stakes at their poker room. Players can join in on the fun at micro stakes starting at £0.02/£0.04, or climb the ranks by joining bigger tables with stakes increasing as high as £50/£100, ensuring there’s something for everyone who plays at Betway Poker. If you interested in playing something other than the usual Texas Hold’em, Betway will certainly cater to your needs. Players can enjoy games like Razz, 7 Card Stud, 5 Card Stud, Omaha Hi/Lo, Omaha, and 5 Card Draw. Betway is more renowned for their brilliant sportsbook and online casino products, and therefore the poker room is usually filled with inexperienced players testing their luck at the poker tables. This provides softer games whenever you play at Betway poker as opposed to other leading poker rooms such as 888 Poker or Poker Stars. The traffic mainly consists of European players, and the busiest action can always be found on their range of freerolls and tournaments. Obviously, there are professionals and grinders on the Microgaming Poker Network, just like any other poker room, but we can confidently tell you that the level of players is much more casual. Betway offers a highly secure and safe online environment for purchasing and withdrawing funds from your Betway Poker account. This is especially true considering they only allow methods that come with a high level of security and fraud protection attached to it. The customers at Betway can transact with absolute peace of mind when it comes to online transactions, and they have a wide range of methods at their disposal as well. Players are literally offered a vast number of options for both deposit and withdraw needs, and the best part is that the process is absolutely risk-free and secure, as maximum stability is always offered to customers. All players can rest assured that none of their financial or personal information will be revealed to any third-parties as Betway also implemented the best SSL encryption and firewalls to protect players from any kind of fraudulent activity. One of the best reasons to deposit funds at Betway through a debit or credit card is the fact that your funds are instantly available. Betway even offers you Maestro and Electron to make your deposits, ensuring players that want to deposit using a gift card is also able to join in on the fun. To deposit funds into your poker account at Betway, you simply need to click on the Betway banking option and select to deposit funds using your debit or credit card. You will then be requested to enter your card details and the amount you wish to deposit. The minimum deposit amount at Betway, using a debit or credit card is £10 with a maximum deposit limit of £50,000. Betway also caters to a wide variety of popular e-wallets, including Neteller, Skrill, Click2Pay, ClickandBuy, Eco Card, and Instadebit. Some of the e-wallets mentioned might not appear in the UK, but as we decided to provide a complete review, we added all deposit methods to prove that Betway caters to an international market with their list of deposit methods. E-wallets are far more superior when compared to debit or credit cards in the online gaming industry. To obtain an e-wallet, you simply need to register with Neteller, Skrill, Click2Pay, or Eco Card, and fund your e-wallet account through a bank transfer or with your credit or debit card. Once you have your e-wallet account, you can easily register your e-wallet within the Betway banking section. Most e-wallet registrations will only require that you fill in your e-wallet account number which is usually your email address. When transferring funds to your Betway account through your e-wallet account, the funds will be available instantly with no additional charges from Betway or the e-wallet company. Wire Transfers are perfect when you don’t want to register any additional e-wallet accounts and also dislike using your credit and debit card. In addition, those that enjoy purchasing large amount can also greatly benefit from Wire Transfers. Wire Transfers are basically money being sent to Betway straight from your bank account. However, it’s worth mentioning that there will be a fee involved when using Wire Transfer, hence why it’s ideal for players who are depositing large sums of money. Unfortunately, Betway does not offer Bitcoin as a deposit option yet which is rather disappointing. Bitcoin is rapidly expanding across the globe and the fact that Betway still hasn’t made the smart move to include them as a deposit option is a major mistake, same with the lack of a poker app on mobile devices. One can only hope that they wake up soon as catch up with the rest of the leading poker rooms. If you are lucky enough to win a substantial amount at a table and want to withdrawal your winnings, you will first need to provide Betway with a list of documents to verify your account. You basically have to prove to Betway that the details registered on your account are indeed correct. This can be accomplished by sending Betway a copy of your most recent Utility Bill (not older than 3 months) to confirm your home address registered, a copy of your ID, Passport, or Driver’s License to confirm your first and last name, as well as your Date of Birth, and if you used a credit or debit card to deposit funds into your Betway account, you will need to provide front and back copies of your card. Please ensure however that you blank out the middle 8 digits and the CVC number at the back. Also ensure that the card is signed before sending it through as this can also delay the withdraw process. Once your account has been verified, you can withdraw your funds through a great range of withdrawal methods available on the banking page at Betway. Almost every player that deposits using a Visa debit or credit card will request their funds to be cashed in through their Visa debit or credit card. Luckily, Betway offers this to UK players and those that do will be pleased to know that there are no additional fees from Betway when requesting your winnings to be paid via Visa. The processing time for Visa usually takes between 1 to 3 working days, and if you outside the UK, it can take up to 5 days to reflect the funds in your account. Kindly note that Mastercard will not be an available withdrawal option. So, if you deposited funds using Mastercard, you will need to register with an alternative method to receive your winnings. To make a cash-in request, you simply need to visit the banking section and click on withdraw. You will then be required to select Visa and the amount you wish to cash-in. The minimum withdrawal amount at Betway is £10. This is significantly lower than most poker rooms and one of the great benefits while playing at Betway. As Betway is not offering Bitcoin as a withdraw method yet, the best option for withdrawing is e-wallets. Neteller is arguably the best of the bunch and offers a processing time of 48 hours or less. That is far more sufficient than any debit or credit card. Withdrawing your winnings with an e-wallet is also safer, more convenient, and doesn’t carry any additional fees. Once the funds are available in your e-wallet account, you can easily transfer the funds over to your bank account. Betway is renowned for their fast payouts through e-wallets with most players reporting that they had their funds within a couple of hours after requesting their withdrawals. Players who like the idea of transferring funds from the bank account to their poker account, can also transfer winnings from their poker account back to their bank account. Players should be aware, however, that there will be an additional charge involved, and the processing time to receive your winnings via Wire Transfer can take up to 3 working days in the UK and up to 5 working days when residing in other countries. So, its certainly not the fastest option available, but the funds will go directly to your bank account, making it much more convenient. We believe Betway has a great range of popular deposit and withdrawal methods, but the lack of Bitcoin, or Litecoin drops our overall impression of this poker room. Nonetheless, they offer quick turnaround times on the payment methods they do support and are known for paying each of their players in a timely manner. There are no major complaints regarding cash outs at Betway and this makes them a great choice for players who are sceptic about online gambling and transacting with their hard-earned cash online. The range of support options is rather limited when compared to other poker rooms, but let’s be perfectly honest, how many of us will ever write a letter to a poker room in our lives? Therefore, the support options on the site are more than adequate in today’s day and age. Our first port of call is always the live chat facility, as this is a support tool that is widely used the most by players. We tested their live chat service at 07:00am and as expected, we were answered within 5 seconds. We made another attempt at 11:00am and were surprisingly greeted with the same response time. Thereafter, we jumped onto their email support to see the turnaround time. Most poker rooms can take up to 24 hours to respond to a simple email request, making this the least favourite way of contacting support in our books. To our surprise, Betway support managed to answer us on our email within 6 hours, that’s very impressive when compared to other leading poker rooms. The last test was their telephone support. Here, we basically ensure the poker representative is clued up about the game, tournaments, and promotions and ensure they present themselves in a professional and friendly manner. This is exactly what we received in return, and instead of just being able to answer all our poker questions, he as also quite clued up on every single product Betway offers on their site. We were very impressed with the level of service we received from Betway. This is one of the most important factors in our reviews. If you have a problem and can’t resolve it immediately, you might as well move on, but this was not the case with Betway. Definitely a reason to show loyalty here, just by their stellar support staff and quick turnaround time alone. The support staff are available 24 hours a day and 7 days a week to answer any query or request you throw at them. Betway has been around since 2006 and is operated by the Betway Group. The company is licensed and regulated by the UK Gambling Commission and is situated in Malta. With more than a decade in the online gaming industry, it comes as no surprise that they had a few scandals and frauds over the years. The company certainly didn’t start off on the right foot but have managed to rectify all previous issues to become one of the leading online gambling destinations in the UK market. In 2013, Sportsbookreview.com, rated as one of the biggest sportsbook review portals, gave the site a D- and blacklisted the Betway site. This occurred due to loads of customer complaints stating that the bonuses were too difficult to clear and therefore couldn’t make a cash-in request. However, Betway got to work and managed to improve their overall management of the site where they replaced the management team twice in 5 years, including their customer support staff. Their turn into the right direction saw sportsbookreview.com increase their overall rating to a B-, and if you look at other leading review portals, you will notice their ratings are far above average. Betway still has a few minor complaints here and there, but overall, they’ve truly cleaned up their act and are providing impeccable service and a stellar range of products to players across the globe. The site is regularly tested by independent auditors and is certified by eCOGRA. This alone should tell you that the site is completely trustworthy and reliable in every aspect. They continue to climb the ranks after a rather difficult start and we honestly believe great things are still to come from Betway. Should I play at (poker site)? With more than a decade of industry experience and proof that the company resolves complaints since 2012, it’s worth a visit. Not only do they provide a great sportsbook, but also offer a range of other products to keep players intrigued. The poker room is rated 11th in the world and sees quite a bit of traffic daily. They have a great selection of cash games, freerolls, and tournaments to keep even the most avid poker player satisfied. Their range of promotions are above average and provide a wide variety of payment methods to fund your account. The only downfall to their poker client is the fact that you can’t play against other players through their mobile app. So, if you are looking to play poker on the move, this is unfortunately not the place for you. But, if you interested in an instant-play platform where poker is offered, allowing you to play without the need to download any additional software, you can’t go wrong with Betway Poker. We’ve spent hours on the World Wide Web, looking for anything relating to the company since their inception in 2006. Unfortunately, there’s not much out there other than their sponsorship deals stretching back to 2014. Betway has managed to sponsor several high-profile sporting events in the UK, including eSports, horse racing, tennis, snooker, football, darts, and boxing. Their flagship sponsorship deal occurred in 2015 when they became the official principal sponsor of the West Ham United Football Club. In the same year, Betway paid out over £13 million to a player in the United Kingdom after hitting the progressive jackpot on the Mega Moolah slot game from Microgaming. This was also a Guinness World Record as the biggest jackpot ever paid in an online slot machine. To protect your personal and financial information, Betway will require a few supporting documents to confirm your identity. These documents include your Passport, ID, or Driver’s license to confirm your date of birth as well as your first and last name, a copy of your most recent Utility bill (not older than 3 months) to confirm your home address, and if you are using a credit card to deposit on their site, you will also need to provide front and back copies, especially if you wish to make a cash-in on their site. Can I track my remaining wagering amount on a bonus? Yes, you will be able to keep track of your bonus progression by simply logging into your account on a desktop or laptop. Once you are logged in, you simply visit the banking page and click on the Withdrawal section to view your bonus balance and cash balance. By clicking on the View Balance Summary section, you will get a complete breakdown of your wagering requirements attached to the bonus you received. Unfortunately, you will not be able to view this type of information when using a mobile device. How can I check if there are any promotions available? Players can easily check if there are any available promotions by selecting the ‘Plus’ located at the top of the page. This will quickly open the Betway Plus page where players can view the promotions that are available to them. When using a mobile device, players simply click on the + icon that will also direct them to the Betway Plus page to view the latest promotions they currently qualify for. Betway Casino is a world-class online casino that’s been integrated into the Betway gaming network. Betway Casino offers a staggering number of casino games from the Microgaming platform. All casino games can either be accessed through the instant-play platform or through the downloaded software. Most of the casino games can be enjoyed on Android and iOS devices as well. Betway Casino is licensed and regulated by the UK Gambling Commission. Betway Casino has an impressive collection of casino games thanks to Microgaming. Players can indulge in classic three-reel slots, some of the most advanced video slot titles, and a fantastic library of progressive jackpot slots. Some of the most popular slot titles include Thunderstruck II, Avalon II, Terminator II, and Immortal Romance. Those looking for something other than slot games can also look forward to a great selection of table games with 8 variations of roulette, including European Roulette, French Roulette, and American Roulette, over 20 variations of blackjack, including Classic Blackjack, Atlantic City Blackjack, and European Blackjack, along with a several other table games such as Craps, 3 Card Poker, Red Dog, and Baccarat. Those interested in video poker will be delighted to find over 20 different video poker games with the most popular including Deuces & Joker Poker, Deuces Wild Poker, Aces & Faces Poker, All Aces Poker, and Jacks or Better. They also offer a live casino section with Live Casino Hold’em, Live 3 Card Poker, Live Dreamcatcher, Live Roulette, and Live Blackjack. The Live casino is available around the clock and is presented with friendly, highly educated professionals that players can interact with through a chat facility. Each live dealer game uses the latest HD webcams to broadcast their games to players across the globe along with a microphone to listen to the dealer when he makes calls on a specific game. Newly registered players will be treated to an unforgettable welcome package consisting of 3 bonuses offers on your first 3 deposits made at Betway Casino. The incredible welcome offers include a 100% match up to £250 on your initial deposit, a 25% match up to £250 on your 2nd deposit, and a 50% match up to £500 on your 3rd deposit. The playthrough requirement for the welcome bonuses is 50 times before a cash-in request will be accepted. Betway also offers a range of other promotions for existing players like free spin offers, reload bonuses, and more. These offers are sent to you through their weekly newsletter, so make sure you sign up to get the latest promotions from the casino. Betway Casino, as well as all their other gambling products, are safe and secure thanks to the latest SSL encryption technology and Firewalls embedded in their software. This ensures all information sent to and from the casino are encrypted and hackers won’t be able to view your personal or financial information. Furthermore, Betway uses the Microgaming platform which is considered one of the most trusted and reliable platforms in the world. The casino games are also frequently audited by eCOGRA, with reports always showing fairness and randomness in each of their games offered on their site. There are a couple of countries that will not be allowed to register with any of the Betway products due to strict regulations. These restricted countries include the United States, Netherlands, Turkey, South Africa, Singapore, Russia, Romania, North Korea, Mexico, Israel, Iran, Greenland, Greece, German State, Denmark, Bulgaria, Australia, and France. The Betway Sportsbook boasts with over 12,000 different markets for players to wager on at any given time, that’s quite impressive to say the least. The list of major markets includes Football, Rugby League, Horse Racing, American Football, Tennis, Aussie Rules, Tennis, Bandy, Golf, Beach Soccer, Baseball, Beach Soccer, Cricket, eSports, Cycling, Floorball, Motor Sport, Gaelic Sports, Darts, Volleyball, Handball, Basketball, Judo, Fishing, Netball, Rugby Union, Politics, Boxing, Snooker, UFC, Martial Arts, Winder Sports, Ice Hockey, and Pool. Betway is also trying their best to capitalize on increasing the popularity of their eSports betting section. The Betway eSports section is rather easy to locate at the top of their homepage, and covers a range of games, including League of Legends, Counter Strike, Dota 2, and many others. Players are also greeted with loads of betting options with markets such as Maps total, Match winner, Correct Score, Map 1 winner, Map 1 first blood, and kills even and odd. The Betway Sportsbook offers a great range of promotions to bettors that are regularly updated to keep things fresh and interesting. If you make £25 worth of multiple bets on football at 2/1+ odds, you will receive £10 free every single week. The £10 will be split with £5 credited on Saturdays and another £5 the following Monday. Players can make a wager on any women’s or men’s single matches during the famous Indian Wells Masters and if the bet loses on the first set, but manages to win the match, Betway Sportsbook will double your winnings up to a maximum of £25. Players simply need to make a win/draw/win wager on any NHL match, and if your selected team can’t score a goal, you will receive your losing bet in the form of a £50 free bet. The Betway Sportsbook also has a unique loyalty program that applies to all their gambling products. Their loyalty program is multi-tiered that will be based on the number of points you accumulate. The higher you climb up the six tier levels, the greater your promotions will become. You will also receive VIP service catering to your every need, tailor-made offers, exclusive gifts, and many other fantastic benefits. Betway further impresses with a live streaming platform, allowing players to watch games in real time while placing bets. The minimum bet at their sportsbook is a mere £0.10 and can increase to a maximum of £500,000, depending on the selected market. Betway also has some competitive odds in every market when compared to other leading sportsbooks such as BetVictor and Bet365. Our overall impression of their sportsbook is above average. Players have a wide range of betting options in several major markets. We are currently recommending Betsafe Poker instead of Betway Poker. Betsafe Poker is on the same network as Betway, so shares the same player pool, they also have a better deposit bonus. So until we sort a few tracking issues with Betway Poker, we ask you to try Betsafe Poker instead. CLICK HERE to sign up and download Betsafe Poker or click the banner below.